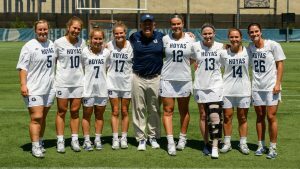 The Georgetown women’s lacrosse team (8-6, 2-1 Big East) defeated the Villanova Wildcats (8-6, 2-1 Big East) by a final score of 12-8 on a sunny Saturday afternoon at Villanova Stadium. The victory came after a disappointing loss to Navy (11-3, 5-1 Patriot League) on Wednesday. 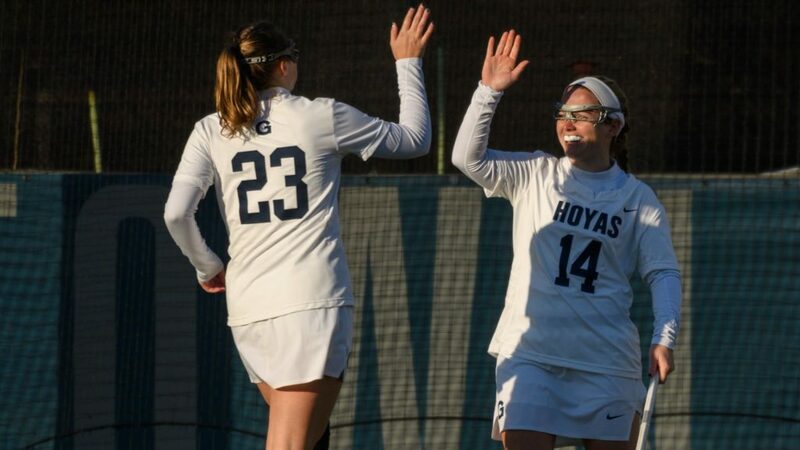 The Hoyas were led by senior attacker Morgan Ryan with five goals and junior attacker Emily Ehle with one goal and three assists, while the Wildcats’ top performer was sophomore attacker Brittany Bruno, who scored three goals off the bench. The Hoyas started the game on the right foot, scoring five unanswered goals in the first seven minutes of play. Ryan started off her day by quickly scoring four of her five goals, while senior midfielder Francesca Whitehurst added the fifth. After, Villanova woke up and went on a 4-0 run that got them back within one goal of the Hoyas thanks to two goals from Bruno, and one each from sophomore attacker Nicole Concannon and junior attacker Liz Trojan. Georgetown was able to answer with a goal from junior midfielder Liza Liotta, but the Wildcats did not let the Hoyas extend their lead again with a goal by Trojan to cut it back to 6-5. After 11 goals were scored in the first 14 minutes of the game, both teams stepped up defensively and only allowed one more goal in the rest of the half, which would come from Georgetown’s senior attacker Taylor Gebhardt after a free-position shot with only 2:20 left. The second half was a goal exchange by both teams, with the Hoyas maintaining their lead until the end of the game. The defenses dominated this half, allowing only eight combined goals, compared to the 12 total goals scored in the first half. Georgetown had five different goals scorers in the second half with Ehle, Ryan, junior defender Katie Hudson, sophomore midfielder Mary Pagano and junior attacker Michaela Bruno each notching a goal. On the other hand, Villanova was only able to score three goals, two by sophomore attacker Brittany Bruno and one by Trojan, during the half, highlighting the great job by Georgetown’s defense. The Wildcats mustered just seven shots on goal in the whole second half. In addition, senior goalkeeper Haelle Chomo made seven saves to keep Georgetown in the lead. The game finished 12-8 for the Hoyas, who dominated most of the game and never trailed. Georgetown’s superiority in the draws was incredibly important for the win and the credit goes to Whitehurst with seven draws controlled, Ryan with four, and Bruno and Pagano with one each. Also, Georgetown’s clearance accuracy, 20-20 on the day, was a huge factor to keep Villanova to only eight total goals. The Georgetown Hoyas return to action next Wednesday, April 17, against the No. 2 Maryland Terrapins (15-0, 6-0 Big Ten) for their final non-conference game. The initial draw is scheduled for 7:00 p.m. ET on Cooper Field. Follow @GUVoiceSports on Twitter for more updates and coverage of all sports at Georgetown.